Within the SKN MMA, there are five use zones consisting of the Transport Zone, Fishing Priority Zone, Recreation Zone, Conservation Zone and the Mixed Use Zone for both Fishing and Conservation purposes. BASSETERRE, St. Kitts — The inception workshop for the St. Kitts and Nevis Marine Management Area Management Plan will take place on Monday, Feb. 11, from 9:15 a.m. to 3:00 p.m. at the Ocean Terrace Inn Conference Room. The consultant contracted to carrying out this management plan is the Caribbean Environment Education Trust with Daven Joseph as lead consultant. 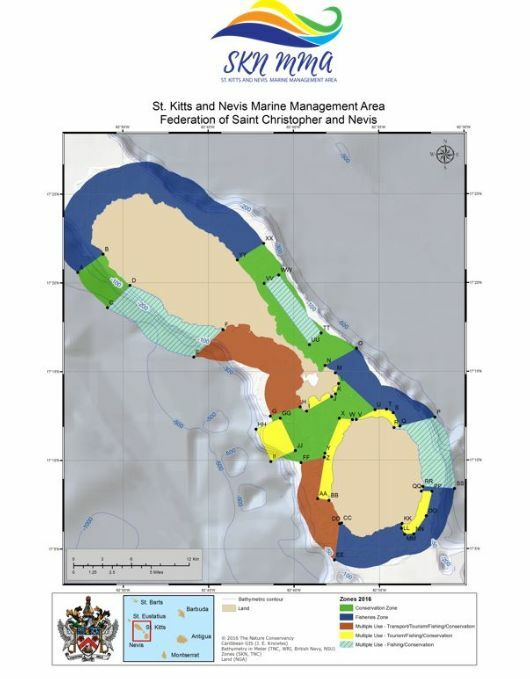 The St. Kitts and Nevis Marine Management Area (SKN MMA) was declared in August 2016. This MMA extends two nautical miles outwards from the marine baseline around the Federation, including Monkey Shoals. Within the SKN MMA, there are five use zones consisting of the Transport Zone, Fishing Priority Zone, Recreation Zone, Conservation Zone and the Mixed Use Zone for both Fishing and Conservation purposes (see map). The rich and diverse ecology within the waters of St. Kitts and Nevis requires proper management as they support livelihood development for users such as fisherfolk, dive operators and the community at large. Inter- and intra-island travel is critical for our twin-island state; notably, is the ocean’s contribution to our tourism sector. The sustainable use of marine resources, which provide food security within the Federation are of critical importance. Therefore, ensuring proper marine management and use should be the focus of all stakeholders.